Splashing it's way into the Pokémon hall of fame! Reviews and players alike have showered latest Pokémon entry Sun and Moon with praise, all excited for the latest games challenges. 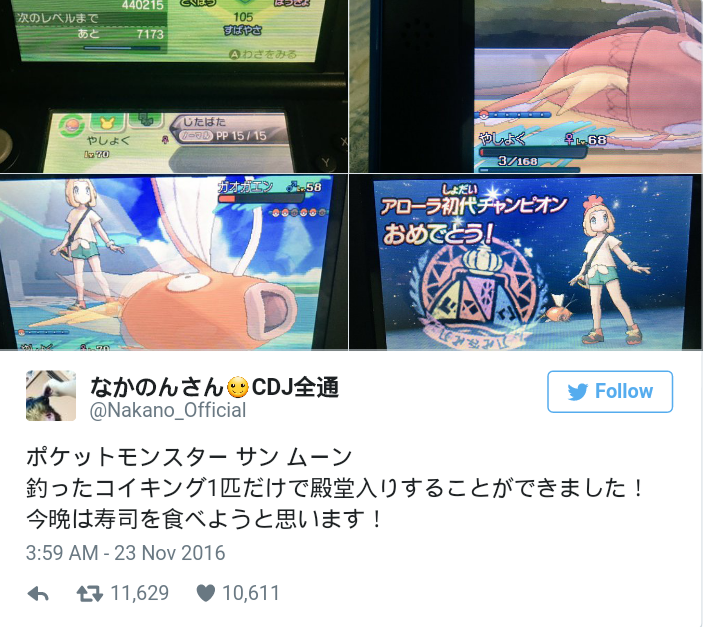 One Japanese gamer decided that challenge wasn’t enough when they took on the game’s trials using only a Magikarp. Twitter user @Nakano_Official made impressive use of Sun and Moon’s Z-Move mechanic. Since even Magikarp can learn to use Z-Moves, this impressive feat was done by utilizing a combination of Z-Moves, Struggle, and a tactic of stalling and healing until opponents ran out off PP for their moves. This is a fun accomplishment and sure to spark some recreations.